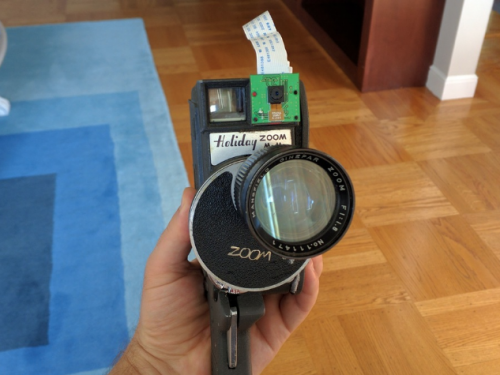 Pi Zero powered Mansfield Holiday Zoom Movie Camera #piday #raspberrypi @Raspberry_Pi « Adafruit Industries – Makers, hackers, artists, designers and engineers! When John Sichi discovered a Mansfield Holiday Zoom movie camera on Yerdle, he was instantly transported back to a childhood of making home movies with his family. The camera was fully operational, but sadly the lens was damaged. 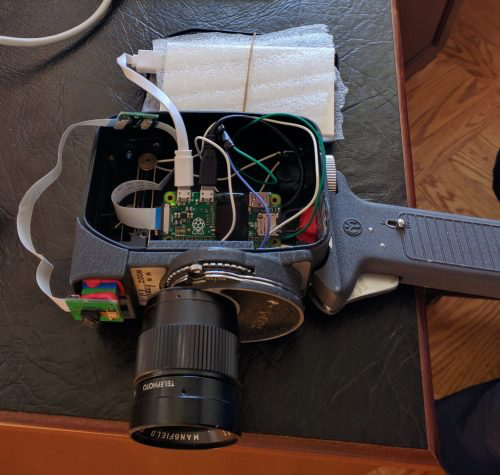 With the cost of parts, film, and development an unreasonable expense, John decided to digitise the camera using a Raspberry Pi Zero and Pi Camera Module. To fit the Pi in place, John was forced to pull out the inner workings; unfortunately, this meant he had to lose the nostalgic whirring noise of the inner springs, which would originally have spun as the movie was recorded. Using a scrap piece of metal, he was able to create a stop/start button from the existing trigger: hold it down to record, and release to stop. A USB battery pack provides power to the Pi, while bits of LEGO and Sugru hold it in place.